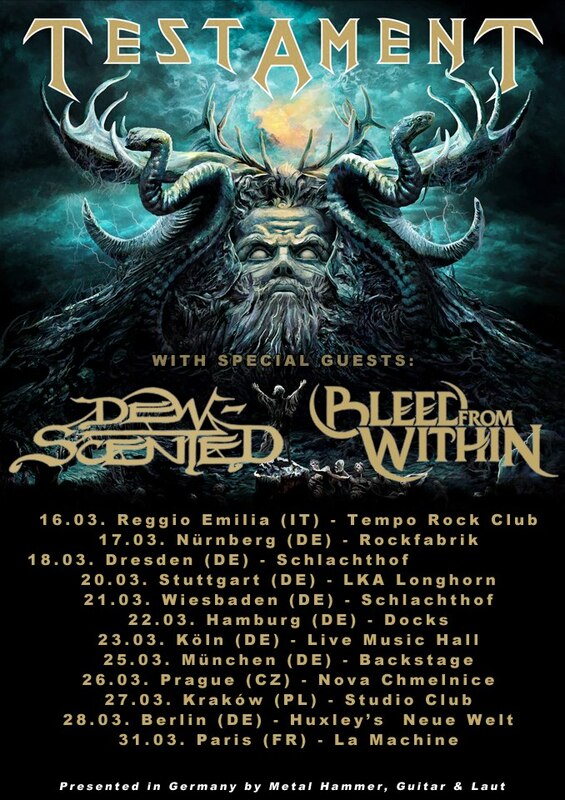 DEW-SCENTED - Relentless Thrash Metal from Germany - DEW-SCENTED » DEW-SCENTED: Testament tour starts this weekend; First details of new release “Insurgent”; Live-Clip! DEW-SCENTED - Relentless Thrash Metal from Germany - DEW-SCENTED » DEW-SCENTED: Testament tour starts this weekend; First details of new release “Insurgent”; Live-Clip! Home > NEWS	> DEW-SCENTED: Testament tour starts this weekend; First details of new release “Insurgent”; Live-Clip! DEW-SCENTED: Testament tour starts this weekend; First details of new release “Insurgent”; Live-Clip! In the light of DEW-SCENTED’s European tour supporting Testament starting this weekend, we are now launching some first details about our upcoming anniversary release…. The title is “Insurgent” and it will be released May 27th, 2013 in Europe via Metal Blade Records and May 28th, 2013 in North America via Prosthetic Records. The tracklisting of “Insurgent” contains 3 brand new songs, 7 new live songs, a total of 7 cover songs and some more. It will be available as limited Digipak CD, Digital Download and the new songs will even be issued as strictly limited 10” vinyl edition. + Obscenity, Leng Tch’e, Aardvarks, Ingurgitating Oblivion, Brutal Unrest, Crosshead, etc. See all of you on the road very soon! DEW-SCENTED to release anniversary album ‘Insurgent’ on May, 27th (Europe) / May 28th (North America) DEW-SCENTED to support Testament on European tour in March; Special anniversary release completed!